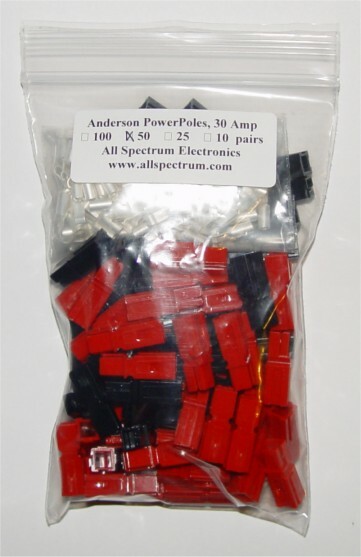 Anderson PowerPole, 30 Amp Connectors, 50 Pairs (100 connectors, 50 Red housings, 50 Black housings). Standard connector used by ARES/RACES. NOTE: Our powerpole kits do not include rolls pins or spiral pins. Anderson does not supply or recommend roll pins, they instead supply more expensive spiral pins, which are better, but even the proper spiral pins can fall out. We recommend against the use of any pins, as they have a tendency to come loose. Good alternates include hot glue, RTV, clear silicon or cyanoacrylic/crazy glue (permanent).